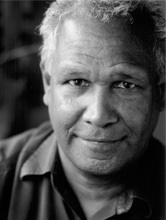 Boori Monty Pryor is an indigenous Australian born in Townsville, North Queensland in 1950. His father is from the Birri-gubba Nation of the Bowen region and his mother’s tribal group from Yarrabah, near Cairns, is the Kunggandji. Boori has worked in film, television, modelling, sport, music and theatre-in-education. He has written several award-winning books with Meme McDonald including Maybe Tomorrow, My Girragundji, The Binna Binna Man and Njunjul the Sun. His stories are about finding strength within to deal with the challenges without, and his skill is to create positive visions of the future for both Indigenous and white people. Boori travels extensively as a performer and public speaker for school students and adult groups throughout Australia and overseas. Boori is Australia’s first children’s Laureate for 2012 and 2013.